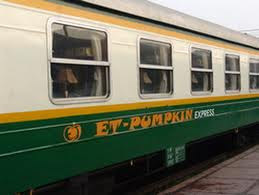 Pumpkin Express Train is another top deluxe transportation service on the railway from Hanoi to Sapa. Pumpkin is the 4th carriage of SP1 and SP2 , which includes 7 cabins with 28 berths, on each of them, each objects and furniture is situated with the same purpose to ensure that the guests are staying under the most indulged and pleasant environment. Moreover, the cabin attendants will further comfort the trip with their enthusiasm, hospitality and helpfulness. 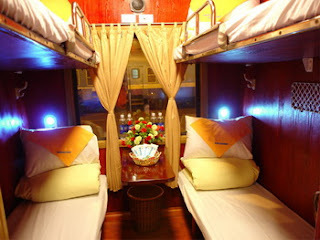 In spite of providing such a perfect train service to passengers with top deluxe advantage, the ticket fare to get on those carriages is quite reasonable. However, the WC is not very pleasant.